Growing up in the humble parish municipality of Saint-Isidore, Que., St-Pierre’s early life was far from easy. Simple things like going to school provided big challenges for the young fighter, forcing him to defend himself as early as the second grade. “To tell you the truth, I was really concerned back in the day about my ego and my image,” St-Pierre admits during a telephone interview. “Even though I knew I was going to get beat up when somebody was trying to steal my lunch money, I always fought for it,” he says. The flashback conjures scenes of The Karate Kid’s Daniel LaRusso, defending himself against a school bully. “I grew up with a lot of anger, but today I’m way more mature. I try to tell kids that these guys might be cool when you’re young, but they will probably become nothing when you’re older.” Much like the crane-stance hero in the blockbuster hit, St-Pierre studied self-defense vigorously before making his mark. Paying for his education through work as a Montreal nightclub bouncer and garbage man, St-Pierre made his debut at Ultimate Fighting Championship (UFC) 46 in 2004. Based on a concept of incorporating different combat styles and mixed martial arts (MMA), the organization began in 1993 as a tournament seeking the world’s best fighters. “I wouldn’t change anything about it,” St-Pierre says. “I love it because it’s like the Super Bowl of martial arts. It’s not one sport, but a combination of many others and the guy with the most tools and knowledge, more often wins the fight.” Now a world-renowned phenomenon, MMA isn’t the first full-contact combat sport to breed soldiers like St-Pierre. An ancient style of unarmed hand-to-hand fighting – pankration – was inducted into the Greek Olympic Games in 648 BC, combining primitive forms of wrestling and boxing. Regardless of when MMA originated, it remains a sport of intense physical strain, requiring uncanny stamina and versatility – a way of life for St-Pierre. Knowing he dedicates every waking minute to perfecting his strengths, I ask the UFC champion what he does to keep fit. “Normally, I wake up, I eat, and then I go train,” he explains. 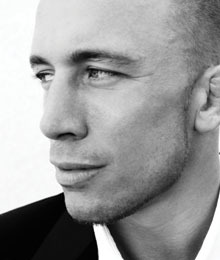 “Everyday, I focus on different disciplines like boxing, wrestling, muay thai, and jujitsu.” St-Pierre’s routine is consistent and continuous, involving a steady cycle of training and eating, with a nap in between. Typical days of relaxation, on the other hand, reveal a man who appreciates the finer things in life. An off-duty visit to the spa includes immunity-boosting repetitions of jumping into a sauna, plunging into ice-cold water, and soaking in a relaxing hot tub. “Then I do something like watch a movie or have a glass of wine,” he says, admitting Pinot Noir is his favourite red vintage. MMA – which is about fighting – can be viewed as barbaric, whereas hockey encourages fighting even though it’s about scoring goals, St-Pierre says with admiration: “It’s true that our hockey can be barbaric, but it’s a very tough sport of speed and we grew up with it so we don’t really see it that way.” With sounds of Montreal’s busy streets in the background, St-Pierre moves on to discuss how other countries view Canadians. “Another thing is that a lot of Americans think we’re all the same but it’s not true. We have a very diverse culture.” The admission reminds St-Pierre of a fan who once asked for a punch in the face, to serve as a take-home souvenir. “I didn’t do it because I told him I was in the United States and I know how you guys like to sue each other,” the fighter says with a laugh. Another side of St-Pierre reveals a less familiar, scholarly persona. Unbeknownst to many fans, the UFC champion enjoys reading about philosophy, psychology, and current issues. I instantly notice a passionate mentor when St-Pierre discusses the importance of fitness among out-of-shape and overweight youth – a subject he used to teach when tutoring high school students. “The problem is a combination of social environment and genetics. A lot of kids are stuck because it’s a genetic problem, but it’s also what they eat at school and the fact that they need to do more sports. That’s what I believe.” St-Pierre’s tone becomes fervent, suggesting the bigger problem is that it’s “the parents’ and schools’ fault.” His words of wisdom carry more than heavy weight, coming from first-hand experience. Looking back on an already-golden career, St-Pierre has some blissful memories. “My happiest was when I won the title against Matt Serra in Montreal. It was in my home country, with my crowd and my people.” But if he could go back in time, it would likely be with a camera. “I wish I could have taken pictures of my best moments as I remember them, but the most important thing is the memory I have in my head.” Looking forward, just as his mother fully supports the all-star fighter, St-Pierre admits he won’t expect his future children to follow in his footsteps. “I want them to be comfortable doing what they love.” The sentiment comes from a man who has truly fought the good fight. After conquering his dreams to fight in the UFC’s octagonal ring, Georges St-Pierre lives day-by-day, defeating life’s most challenging jabs. Beautifully written interview…I really love interviews that concentrate on GSP more as a person than a fighter, he’s such a great fighter, because of the great person that he is. I adamantly agree with Denise! This interview was beautifully written.